I’d been all excited about The Good Guys, it sounded a bit like Life on Mars, but without the brain twistiness – a collision of modern and retro policing all bundled up in one partnership. The straight guy played by Colin Hanks (Roswell, son of Tom) and the not-so-straight guy played by Bradley Whitford and his moustache (West Wing, Studio 60, Revenge of the Nerds II). And I really thought to myself that I didn’t care what type of show it was, I would love it because I loved both of them. I’ve been struggling with this review for over a month now and even watched the pilot again in an attempt to work out what I really felt about the show. After a lot of agonising the only conclusion I can be forced to draw is that it’s very good, but I didn’t like it. The thing is, I’d vowed not to watch any more comedies, because I don’t really like them. I have to be in exactly the right mood to watch them, mostly with sitcoms that involves settling in with dinner, a crossword or a magazine and paying minimal attention. I don’t mind things that fall into the (painfully named) middle ground of dramadies – shows that manage to capture the fact that life is both funny and dramatic all at once, but even those, if the humour relies too much on silliness or cringe inducing embarrassment, I tend to switch off. The Good Guys I guess could best be described as an ‘action comedy’, but it leaned too far into comedy for my tastes. It’s similar in philosophy to Burn Notice (probably because it’s created by the same guy), but that show comes down closer to the action side than the comedy. Burn Notice’s humour relies on sarcasm and a very dry voice over. The Good Guys’ humour too often drifted into ridiculousness and going over the top. There’s nothing wrong with that kind of humour, and The Good Guys does it with considerable style and talent – I just don’t really like it. The Good Guys is a good show. It’s cleverly constructed with smart dialogue,, actors with a lot of charisma and chemistry and an overall lack of predictability that’s quite refreshing. I’m definitely in the minority not liking it*, the reviews have been spectacular and it will start its second season almost immediately after finishing its first. I really do recommend everyone to at least give it a try, because I’m certain that it’s my loss that I just didn’t like it. * TV Squad, CliqueClack and The Watcher to name a few. I watched both these pilots on the same night, and as they’re kind of two sides of the same coin I decided to review them together. The shows are both centred around eponymous towns, that aren’t nearly as idyllic as they appear and are actually home to a random selection of supernatural types. The structure of the pilots are quite similar. Each features the arrival of a new law enforcement officer. For Haven it’s a female FBI agent sent to a small town in Maine, tracking an escaped prisoner, who soon turns up corpsified in a strange manner. The Gates meanwhile has a new sheriff and his family arrive in the ultra secure gated community only to immediately encounter a missing person case, caused by a hungry vampire who lives next door. From there the two shows diverge. 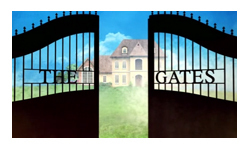 The Gates, being a drama on ABC takes the melodramatic approach. How does the town work? What are the power struggles? How do people/vampires/werewolves/witches cope with their half secret existences? How will the new sheriff upset the balance? It’s all about the secrets, the traumas and the inevitable shouting and crying. Haven takes a slightly more relaxed approach to things. The plot is nothing special and to be honest is pretty clunky, often introduced on the front of a sledgehammer, but it’s enough to keep things ticking over. What makes the show work is that the characters are interesting and entertaining. The happy-to-believe female FBI agent is bright and confident, contrasting with the deputy sheriff (and son of sheriff) who is moody and cynical. They fall into an easy, sarcasm lead partnership that’s fun to watch. The rest of the town seems to be populated by the kind of low-level eccentrics who you expect to find in a small town on a TV show. Outside of the differing genres and budgets, the biggest difference is in how they address their weirdness. Shows like this have to be very aware of their predecessors, it’s very easy for the audience to roll their eyes and point out that it’s all a bit X-Files. But if the characters themselves roll their eyes and reference The X-Files, the audience laughs and immediately settles in. SyFy channel excels in making that kind of show, it’s a feature in everything from Farscape, to Warehouse 13 – characters pointing out how ridiculous their situations are. The other option, having them take it all entirely serious, makes it a lot trickier for an audience to engage. I watched The Gates constantly making comparisons to Twilight, but the characters didn’t spot it. It makes you wonder whether Twilight exists in their world. This is particularly frustrating given that the teenage love triangle involving a werewolf (but no vampires yet) is so painfully familiar it’s boring as soon as it appears. I wish they’d stuck to just focussing on the adult characters – there are plenty of shows/films/books out there about teenagers dealing with these supernatural things, not so many with adults. Both shows were interesting, with strong concepts, good casts and engaging story lines. 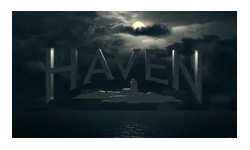 Haven is an easier show to enjoy, and therefore almost certain to go on to my schedule – it’s one to watch over dinner with the housemates. The Gates is harder to get into, but with more opportunity to look at things in more depth. They were trying to cram a lot into the pilot, so I’m willing to give them a little bit of leeway on the more clumsily handled aspects. I’ll add it to my “keep an eye out” list. Haplin, known as Happy Town, seems the perfect little town. The bread factory that employs a notable chunk of the population exudes wafts of fresh bread smell across the town and everyone seems aggressively pleasant. But dig a little and a mystery is revealed, years ago people started disappearing. Then just as mysteriously as they started, the disappearances stopped, leaving holes in the community where seven men, women and children used to be. But with the arrival of a couple of new strangers and a violent murder, everyone is on edge again. The show is being advertised as a modern Twin Peaks, but I have to slightly embarrassingly admit that I’ve never actually seen Twin Peaks. Maybe this is a good thing for Happy Town though, many reviewers seem to be getting hung up on that similarity and only judge it in comparison to that show, or even more dauntingly, to the memory of the classic that aired twenty years ago. I’m guilty enough of doing that with other shows, so can’t really criticise the reviewers, but as I’ve never seen Twin Peaks I can at least rise above it on this occasion. I was looking forward to the show, partly because of the cast which features some personal favourites, but mostly because I’m a big fan of this sort of contrasting show. Taking a setting that is so normal it’s almost abnormal in itself, and then adding a layer of dark weirdness over the top. Happy Town gets off to a good start – opening with a classic horror film scene, right down to the use of blue lighting, screeching birds and a murderer who’s always in silhouette. Then the next scene is classic of any show set in a small-ish US town – there’s the overly perky real estate seller introducing the new girl to the town. But the problem I had was that each bit was either happy or creepy, there wasn’t really any interweaving of the two. It’s not like Pushing Daisies or even Fargo which were carefully written so that the humour running through seemed either black when overlaid on the happy, or perky when overlaid on the creepy; simultaneously giving consistency and contrast. Without the good and evil interweaving, Happy Town wasn’t unsettling, just schizophrenic. The writers were definitely struggling. There was a lot of characters, locations and plots to introduce in 45 minutes and they did this with some exceptionally painful chunks of characters reciting exposition. The other problem is that a lot of those characters and plot threads were so laden down with cliché that they really didn’t need much explanation anyway. There’s a Romeo and Juliet relationship, a couple of mysterious strangers, a gaggle of gossiping widows, a few slightly bumbling police officers and a group of yokel bullies living on a scrap yard. I’m optimistic the characters can be dragged out of their stereotypes, because the cast is full of names that I’ve respected for quite a while – Sam Neill (Jurassic Park is probably the most recognisable, but to me Amy Acker (Angel), Abraham Benrubi (ER) and Steven Weber (Studio 60) are all good draws too. While I think the show has some pitch issues, it does have all the building blocks and foundations that it could sort itself out later, when it’s not trying to squash so much into a single episode. The plot elements and mysteries are certainly intriguing, if not riveting. I didn’t come away from it feeling excited or desperate to find out more like Lost or even FlashForward did, but then neither of those really delivered on their initial promise (imho). Instead I came away from Happy Town feeling quietly intrigued but not overly enthused, enough that I’ll keep an eye on it, but nowhere near enough that I’d recommend everyone rush out to watch it. New Orleans, three months after Katrina, rebuilding the city, the lives and the music. A couple of things you won’t know from the show – Treme is a pronounced treh-MAY, and the name refers to a neighbourhood of New Orleans , “an important center of the city’s African-American and Créole culture, especially the modern brass band tradition” according to wikipedia. The fact that the television show doesn’t actually tell you that is pretty indicative of the show; it’s beautiful, heartfelt, passionate, possibly superb… and I had very little idea what was going on a lot of the time. I couldn’t tell you the names of any of the characters and often couldn’t understand what they were saying thanks to a combination of strong accents and loud background music. In fact, that’s similar to my reaction to The Wire, the show the Treme’s creators (and some of the cast) are best known for. I really wanted to like this show, and while I think it may well be qualitatively superb, after the extended pilot episode I had absolutely no desire to watch any more of it. I didn’t connect with the characters; I felt a lot of sympathy for them and respected their spirit, but I in a kind of abstract way where I was very conscious I was actually thinking more of the real people in New Orleans than the characters on the screen. The fact that it’s so believable and so depressing, that you’re watching something for entertainment when there are people actually living these lives and responding to these situations, made me feel uncomfortable, and far from entertained. While I feel compelled to write an honest review about how I responded to the show, I really don’t want to discourage anyone from watching it. It’s a good show, possibly even amazing. It’s really beautifully shot, the script has a lyrical, poetic quality to it and the contrasting characters and situations are cleverly introduced. There are a lot of New Orleans natives involved in the production and the passion for the city and particularly the music really came through. While I myself will probably not be tuning in to watch this, I’d heartily recommend that everyone watches at least the pilot, it’s a superb piece of work – I just didn’t like it, and that’s probably my loss. This was pretty miserable. I was sat in an empty house watching this by myself, which was for the best as people would probably have thought me insane as I continually shouted at the television with variations on a theme of “oh come on”. The episode is completely predictable from start to finish, bumbling from one cliché to the next. The characters were mostly so-so, playing traditional TV types. The head of department has a breakdown in the first few minutes of the episode and strips naked and walks out (didn’t Boston Legal start the same way?) leaving his young team somewhat leaderless until Jeremy Northam turns up to ‘subtly’ take charge. His character is about the only engaging thing in this episode actually, a former army doctor who’s now looking for sunshine, there’s a bit of Hawkeye Pierce about him and there’s some potential for some interesting relationships with his young team who have less general experience, but more specific experience in the department. The rest of the characters however are unremarkable, fast-tracked female with a will-they-won’t-they thing going on with the good looking, slightly rebellious bloke. A junior doctor still finding her feet and an all knowing head nurse who looks like a linebacker and spends most of the episode doing exposition. As with quite a few shows on the air it just feels like a cheap reproduction of other successful shows. As it’s Bruckheimer it’s not actually cheap at all, there’s a lot of money spent on it which somehow makes it worse that it feels cheap in terms of writing and acting and story. The big action sequence in it didn’t actually blow me away (pun absolutely intended) because it felt like a processed piece of film-making. It’s the emotional difference between creating a disaster with stuntmen and real special effects and creating one using green screens and computers, one is visceral and real, the other is technical and arty. While I acknowledge that I’m pretty hard to impress these days, I just can’t see anything in this that would appeal. The really enjoyable Trauma is struggling for viewers despite its interesting characters, big budget stunts/special effects and beautiful new location in San Francisco. If no one is watching that, I don’t really see why a knock-off ER in over-exposed Miami with whiny good looking doctors in a well funded specialist unit would succeed. And if it does, then I slightly despair. 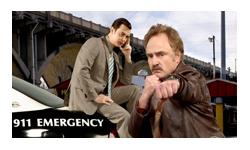 It really did just leave me with an urge to reach for the ER Season 1 dvds. The show centres around Deputy US Marshall Raylan Givens, a character created by Elmore Leonard (who’s also an exec producer). He’s something of a throwback, like a Wild West sheriff all about justice, not necessarily the law, speaking softly and drawing fast. It’s enough to make you get poetic. Timothy Olyphant Deadwood, Hitmanis superb; award winning level superb. It’s very easy for ‘strong silent’ types to be dull and flat, but Olyphant (and the writers of course) manage to create a multi-faceted, multi-layered character in just 45 minutes. The existing team of marshals Givens is joining in Kentucky seemed competent but with only a few lines of dialogue each, they didn’t really get to flesh out their roles. The strength came in characters who I thought were guest actors for the episode, but seem to be in it more long term. Walton Goggins (The Shield) as the primary ‘villain’ of the episode was great, really giving Olyphant someone to play off. And Joelle Carter chewed her way through a Southern accent to make an interesting character too. Both do an impressive job ploughing through some chunky monologues, but no amount of talent could quite hold off my cries of ‘get on with it’. The story, I’m not so sure about. I think the plot and (I’m assuming) crime-of-the-week will only be there to support the characters and the setting. You could almost count the small Kentucky town as a character in its own right, another throwback– coal mines, white supremacists and religious fanaticism. I suspect this show might be about US Marshals in the same way that Friday Night Lights is about football, i.e. not so much that it really matters. The comparisons with Deadwood are obvious, Olyphant’s character could easily be a descendent of the Sheriff he played in Deadwood and it looks to be setting up the same sort of themes of law of the badge vs. law of the land. It’s a lot more family friendly though, I’ve seen far more objectionable stuff on CSI. I was impressed with Olyphant’s character, but to be honest the rest left me somewhat cold. There are some interesting tense moments, not knowing how the characters are going to react, but these are interspersed with some really painfully dull speeches that just drone on. While I suspect it’s going to be critically popular, I didn’t really see anything in the pilot that really made me want to tune in next week, but I’m willing to admit I may be wrong on that, so will keep an eye on the reviews and maybe pick it up later in the season. The Brief – Your standard procedural type thing, but the team is a group specialising in past life regression and their witnesses are reincarnations of victims. It’s taken me a month to get round to watching this pilot and writing the review during which time Past Life aired three episodes, lost 60% of its audience and got cancelled. Making my review a little bit pointless. This is one of those shows that should never have made it out of proposal stage. Everyone involved threw everything they had at it, but they were never going to recover from the fact that it’s a bad concept. The suspension of disbelief required to appreciate this show is just too high. You not only have to believe in reincarnation, but you have to believe in it to the extent that you’ll accept people recalling their past life accurately enough to obtain the clues required to solve a murder. The pilot does tries to address the scepticism, a character says “if I hadn’t seen it with my own eyes, I would never have believed it”, which is fine for the people inside the television, but those of us sitting on our sofas are too aware we’re seeing it through the lens of our television screens. I guess as a science fiction fan I should really be able to appreciate a show regardless of whether I believe in the concept. I mean I’ll happily watch Fringe, Supernatural, or Buffy and accept that there are parallel universes, demons and vampires just slightly out of sight, but why couldn’t I just suspend the disbelief for Past Life? Is it just that my brain is so used to procedurals being realistic, or at worst exaggerations of what’s real, that it is completely unable to accept that something that looks, sounds and acts like a procedural is in fact borderline science fiction? Is there some subliminal message that has to be used to communicate that, one that Fringe, Lost (ymmv) and the like send out, but Past Life failed? Whatever the reason, apparently 6 million Americans agreed with me and didn’t bother tuning in for episode 3. It’s a real shame because I liked the characters and writing, it wasn’t flashy or spectacular but it was solid and interesting. The characters felt like real people, not too quirky, not too dull; they had emotions that while very familiar in real life seldom make it into TV pilots – exasperation, apathy, that faint mania you get when a puzzle is solving itself. I did role my eyes when it was revealed the lead man was troubled following the death of his wife, a painfully overused trope on American TV at the moment (CSI: NY, The Mentalist, and at least 3 other shows that I won’t spoiler). The female lead was pleasantly chirpy, sympathetic without being overly maternal, although she had her own trope of ‘commitment phobic dating problems’. It’s not enough these days to be a regular old crime solving drama, you’ve got to have some kind of MacGuffin to pin it on, like the episode naming convention from Friends – The One With the Lie Expert, The One with the Missing People, The One with the Pretend Psychic – it’s pretty tricky to find something new. The One with The Reincarnation is dead on arrival, and it isn’t coming back. Links: Official Site, TV.com, wikipedia, imdb. Reviews: TVSquad thought it was ok but unremarkable.